Filottrano lies upon the gentle hills few kilometers away from Jesi. It is well known for a widespread epidemic dissemination of men’s wear factory stores and fashion outlets (once I calculated a range of a textile factory each 6 inhabitants), of unknown and famous brands or common subcontractors, up to the invention – for the region Marche – of the custom tailored suits for men, suits worn by sports’ teams and VIPs. Such as many other village in our region, Filottrano is a treasure chest for traditional flavors. In 2014, not so many years ago, Gallo Rosso was established on the ancient town walls under a small arch in front of the church. 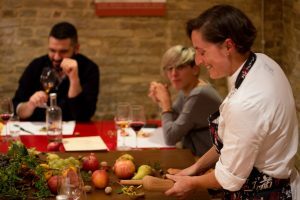 Gallo Rosso is a Trattoria indeed, as its two owners – or maybe better call them “creators”, Gessica Mastri e Andrea Tantucci – want to underline. In fact, at the Gallo Rosso you feel the traditional connotation of the word, but also added with a contemporary touch and reprocessing style that make the trattoria a unique experience compared to the local cuisine. Our strong point (is usually always the second question) is the ingredients they use, they repeat that more than once. 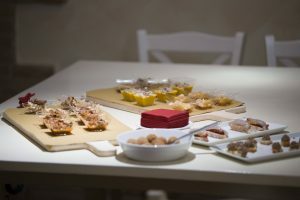 “Our cuisine is firmly connected to producers, by a direct relationship – Andrea explains – and this a unique situation in our area: much easier would be a trattoria where you can eat Pasta al Ragù as first course, and roast meat to follow… We tell the story of each dish we offer, instead: I don’t want to present only my work, but also the passion and sweat of everyone who has worked to produce the food. It is something more than only a simple recipe: our menu comes from the available raw materials”. Every two or three sentences Andrea and Gessica tell me about Doriano Scibè, the cheese factory Piandelmedico, the pasta factory Mancini or olive oil factory Valeri. They call the suppliers by first name (Doriano, Giulia…), as if they were one of the family: “Doriano supplies meat whenever he can, what is fresh and available at the moment, in accordance to the season. It might happen that he delivers at 4 a.m. in the morning, after he finished his job at the farm. Ingredients are not delivered by couriers in vacuum-sealed bags that you can open and cook in few minutes. The ingredients we use, are the ones you used to be cooked in the past. They are products difficult to cook, but you can actually taste the difference, right before you can think of how they were treated and which is the recipe we use”, Andrea and Gessica tell me with passion and amusement. 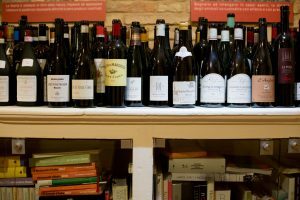 In three words, Gallo Rosso is: Raw material, Tradition and Conviviality (this is the extreme summary I wrang out of them). “I believe that our customers – says Andrea – already knows our region, Marche. It is just a mirror of what surrounds us: it is not a pure farm-to-table, but it is just the best we have around us, that we cook in the best way, respecting animals. So that we don’t use at all products from industrial breeding farms or intensive agriculture”. It’s easy to understand that raw material and tradition are two main features, just taking a look at the menu. 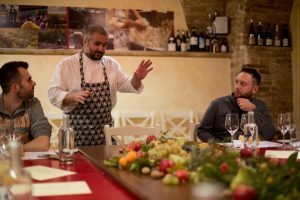 The main dish is goose cooked with Verdicchio wine: Gianni Muro on Il Venerdi di Repubblica also praise the dish, in his section Mangia e Bevi advising that “everyone should go to Filottrano and eat Goose cooked with Verdicchio wine at the Trattoria Gallo Rosso”. The dish is all year long on the menu, except during the three winter months (tradition, we said); or Macaroni with Goose “del batte” (the typical sauce used for pasta during the threshing…ancient tradition, as well); among the first courses there are also Tagliatelle Gallo Rosso style, with a “jus” (meat juices) of meats and parmesan cheese; or the “dish you do not expect”, as Andrea defines it, the boiled rabbit served with salted anchovies and borage: a smell profusion, even before you eat it! And still, fois gras pâté of Marchigiana meat (Angus?! What the f@©#! ?…) with a reduction of Rosso Piceno red wine and hazelnuts. Raw material and tradition: to this point it seems easy and natural to create conviality. Well, those two add in another ingredient. A thick agenda of selected events, shows, gala dinners / conferences about food and food history, “music&food” evenings (it’s not a case: in 2009 Andrea is author, together with Paola De Angelis, of Rockitchen: 30 menues for 30 LPs. Those who read it, already knows the mood of those events), readings and events. Only one dogma: who manages these events and speaks about music, food, poetry must be definitely an expert. To name a few, together with the said Mrs. De Angelis? Let’s name those who will join the shows in the future, Tommaso Lucchetti, Romina Antonelli, Michele Alesiani… for everybody’s taste, for every sense.